Families Of LA Serial Killer's Victims Still Await Closure Police allege Lonnie Franklin Jr. terrorized LA for decades, targeting mostly young black women. As his trial wraps up, critics wonder if racial bias caused the investigation to take so long. Defendant Lonnie Franklin Jr. listens during opening statements of his trial. 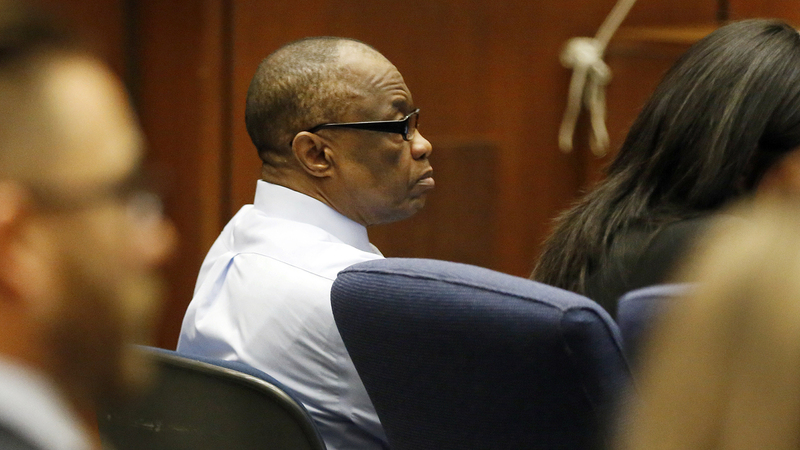 Franklin is accused of serial murders that terrorized South LA. For 25 years, the alleged "Grim Sleeper" killed mostly poor, black women in South Central LA, some of whom were prostitutes. His trial is close to wrapping up, but it hasn't been getting much attention — a situation observers say is fitting because for years, neither did the killings themselves. Prosecutors have laid out their case against Lonnie Franklin Jr. for more than two months. They have talked about the lengths police went to to finally catch him. For example, detectives posed as busboys at a pizza parlor where Franklin attended a party. They took pizza crusts off his plate to use as DNA evidence. It matched samples taken from murder victims. For almost six years since that sting, Porter Alexander has been coming to this downtown LA courthouse for nearly every pretrial and trial proceeding. His daughter, Alicia Alexander, was murdered in 1988 when she was 18. He keeps pictures of her on his phone. 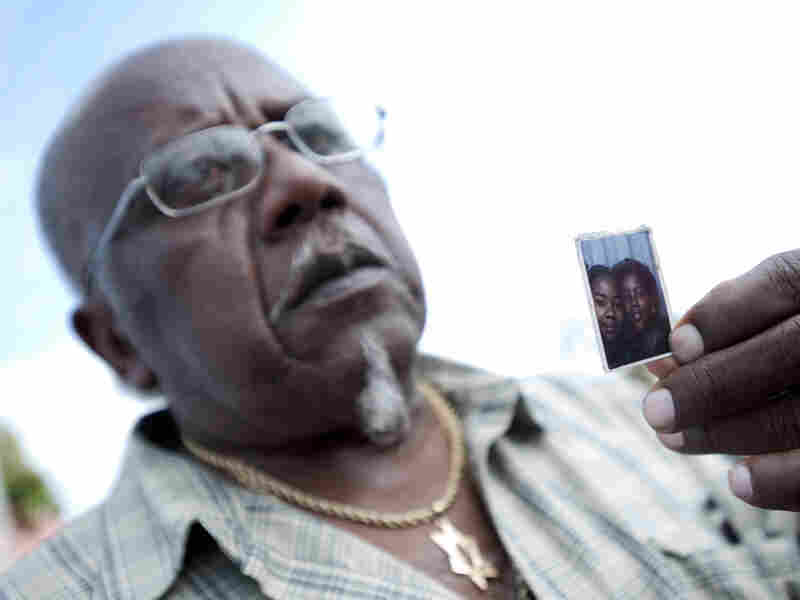 Porter Alexander Jr. holds a photo picturing his deceased daughter, Alicia Monique Alexander, in Los Angeles on July 7, 2010. "I just want to show you, that's her," Alexander says, pointing to the pictures. "That's the youngest, that's my baby right there." In the small courtroom, Alexander sits just two rows behind his daughter's alleged killer, who is shackled in an orange prison jumpsuit. "It's taxing, very much so, but, you know, you've gotta find some strength in order to endure to continue on," he says. "I just can't let this be something that destroy me; if I allow that to happen, then this man have totally defeated us." The nickname "Grim Sleeper" first came about because of an apparent gap in the murders. There were the unsolved slayings in the 1980s, and in the early 2000s, bodies of women again started turning up in alleys and dumpsters in South LA. But it's now thought that the killer may have never "slept." Police uncovered nearly 100 pictures of unidentified women from Franklin's home. 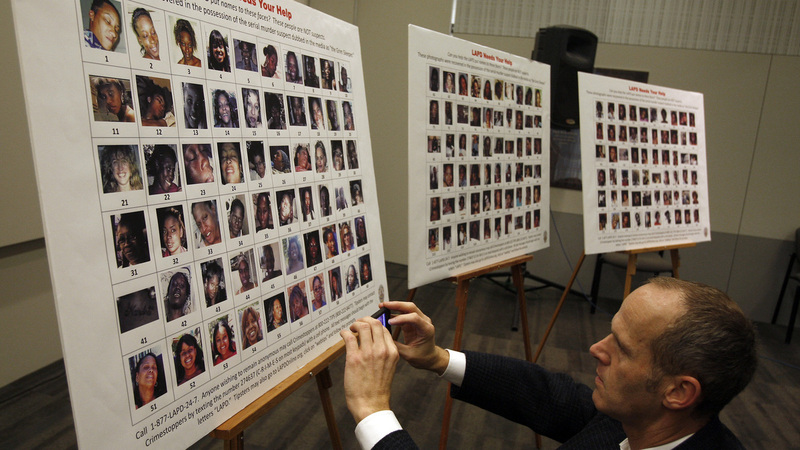 Frank Stoltze, a reporter for Southern California Public Radio, takes a photo of the 180 photographs and video stills of 160 women displayed at a press conference. The photos and stills were found in Lonnie Franklin Jr.'s possession. The initial mishandling of the case didn't surprise people in the community like Alexander, who never had a lot of trust in the cops. "You know, I'm not a racist, I'm not a person that looks at that," he says. "I look at things that went on in South Central Los Angeles and what was overlooked." By overlooked, he is talking specifically about the time when his daughter was murdered. The 1980s were terribly violent, and crack cocaine was rampant. It has since come out that the police may have known a lot more about the serial killer than they let on. They knew there was a pattern. Margaret Prescod, founder of advocacy group Black Coalition Fighting Back Serial Murders, says at one point they even had a vehicle description. But people in the neighborhood, especially women, were never warned that any of this was going on. "We went down to what was then Parker Center Police Headquarters to find out about the murders, see what was being done about it, how the community was being informed, and we were told by the guy in charge, said, 'Why are you concerned about it? He's only killing hookers,' " Prescod says. Margaret Prescod, founder of advocacy group Black Coalition Fighting Back Serial Murders, grabbed the mic from LAPD Chief Charlie Beck at a press conference. That led Prescod to form the group. Today, she still describes herself as an agitator of the Los Angeles Police Department, arguing that if this had occurred in a more affluent, whiter neighborhood, justice would have been swift. There would have been a national uproar. "And we knew it had to do with the race of the victims, and that they were impoverished in a community that not that many people cared about," she says. When the alleged Grim Sleeper was finally apprehended, Prescod famously grabbed the mic from LAPD Chief Charlie Beck at a press conference, holding up a trove of archived police documents. "Please stop referring to these victims as prostitutes. They were women, they were mothers, they were loved by their families and their communities," she said. LAPD detectives declined to comment, citing the ongoing trial. But Chief Beck recently told NPR that the 1980s were a different time for his department and the city. The crime rate was much higher, and the police force, much smaller. "Those were very, very difficult days, and things did not get investigated to the degree that we're able to do them now," Beck says. "I wish we could go back in time and fix all that, but that's not possible to do." After years of court-ordered reforms, relations between the LAPD and the community have improved in some parts of South LA, but not so much has changed in others. Now, the violent crime rate is going back up. Alexander still lives in the same neighborhood where he raised his four kids. "Everything that was going on then, is going on pretty much now," he says. "It's even gotten somewhat worse." Today, he says, he hears more shootings and sees more guns — just the other weekend two men were killed at a liquor store near his house.